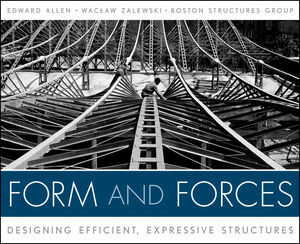 Welcome to the Web site for Form and Forces: Designing Efficient, Expressive Structures by Edward Allen and Waclaw Zalewski. This Web site gives you access to the rich tools and resources available for this text. Form and Forces Graphical Techniques is a series of eight step-by-step lessons in graphic statics that were prepared by Joseph Iano. Click on the “Welcome” icon first. These are best experienced in the sequence in which they are given, but they will also be helpful out of sequence in confronting particular problems. These lessons are thorough and well-tested, but they are not interactive. The student cannot play with them to test ideas about structures. Thus it is good to supplement them by giving students access to Active Statics, which is described next. Active Statics: Simon Greenwold developed this series of interactive demonstrations as a way of trying changes in a system of forces and/or members and discovering directly the consequences. These have primary uses similar to those listed above. Their interactivity allows for free experimentation with proportions and shapes of structures to find out how well they work and how they might be improved. You will find these particularly handy for projection in class, where you can demonstrate live what happens when a pole is moved or the configuration of a truss is changed. Students will find these demonstrations addictive and entertaining, like video games, but they are also serious learning and design tools. There is a manual that runs in parallel with each demo on a split screen. You can follow the manual, or you can venture out on your own. After unzipping this file, click “Start” to begin demonstrations. Statics Pad is a special-purpose CAD program for working with graphical solutions. Statics Pad will not solve your problems for you. It will just make it easy to construct the diagrams neatly and accurately, to try variations of the design, and to measure vector lines accurately to arrive at the same numerical results as a digital solution to the same problem. An important feature of Statics Pad is that it is interactive in the same way as Active Statics. You can click on a node of a truss and move it, and the force polygon for the truss will change instantly to reflect the consequences of the change in shape. Or you can move an intersection on a force polygon, and the shape of the structure will change accordingly. This capability for free experimentation makes Statics Pad a powerful design tool and a versatile tool for projection in the classroom. The worksheets that are associated with many of the chapters are available here and may be printed out for your use. You may also consider downloading Formfinder Light, which is a program used in Chapter 12 to help design a fabric structure. It is available as a free download from http://www.formfinder.at/main. By going directly to this source, you always have available the latest version.